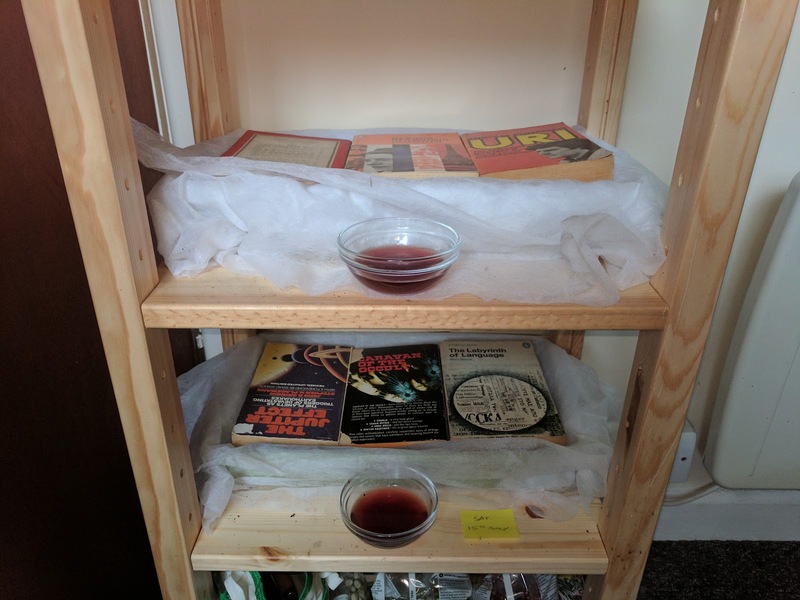 Anti-work, gardening, veganism, Star Trek, and worms. 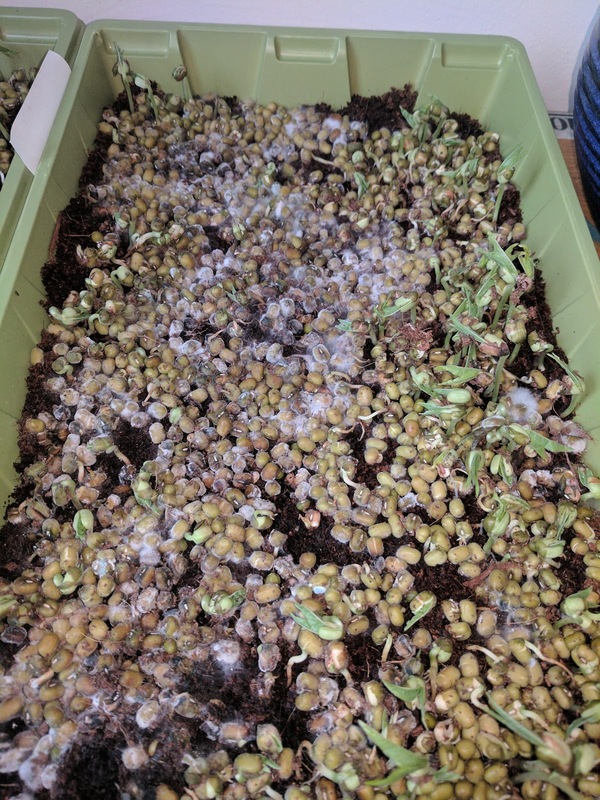 Mould spread quickly, and there was very little growth, none of it edible. 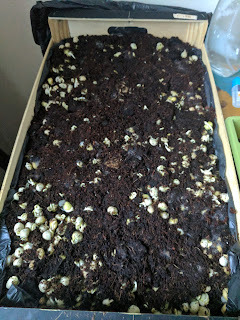 I'd soaked the seeds overnight before sowing (good) but covered them with a thin layer of soil, rather than leaving them exposed (bad). I also didn't cover or weigh them down, just left them as they were (inadvisable). Still, even when covered, it's hard to keep the flies away. Not knowing what I was doing, I sprinkled some dried lavender among the pea shoots. This had no positive effect whatsoever. I'm very impressed with rambo radish seeds. 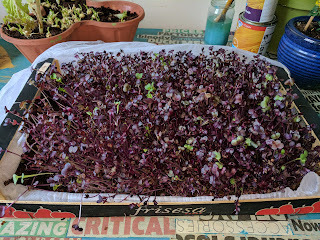 The ones I bought have yielded a wonderful crop in only six days, and I've been snacking on them ever since. 1. Sterilising trays. I've submerged the trays in hot water with a splash of bleach and a splash of white vinegar for about 5 minutes, before rinsing and leaving to dry. 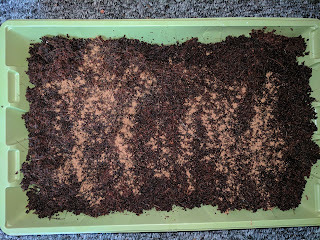 I've raked this in and patted down the soil before adding the seeds. 3. 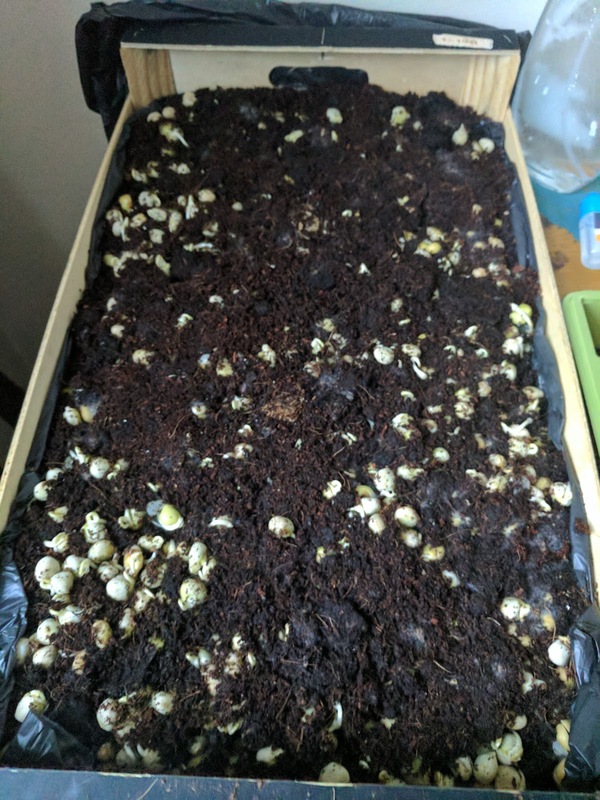 Allowing the seeds a little more space. 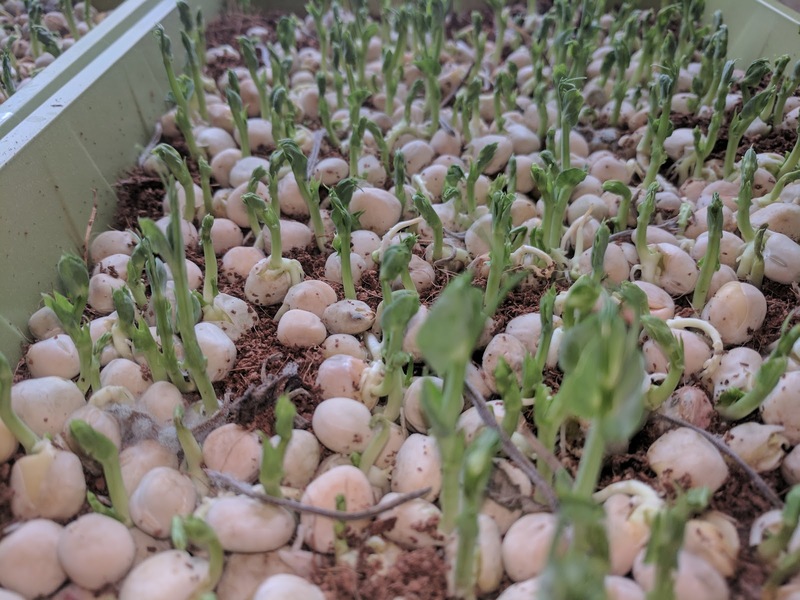 I've noticed that pea shoots need a little more room than I've been giving them to put down their roots and for the shoot to emerge. With this in mind, I've not used as many per tray as I did previously. Hopefully this should result in a higher yield overall. 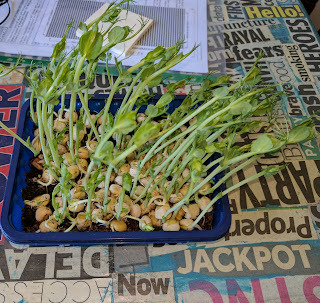 Only about half to two thirds of the pea seeds I've sown have actually given me edible shoots. I'm sure this can be improved upon. And that, my friends, is that. 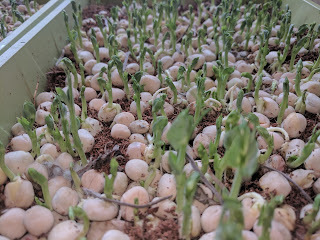 Today in total I started two trays of peas, another tray of mung beans and for the first time, a tray of adzuki beans. 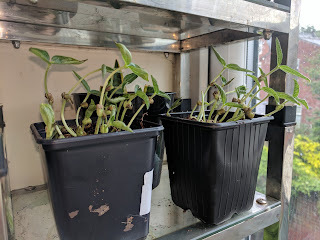 Browsing through Tesco yesterday, I quickly checked online as to what sort of dried beans they sold there produce edible sprouts. Adzuki beans seemed like the most interesting option. 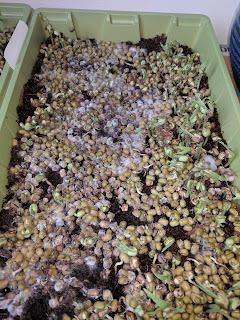 All the seeds have been soaked for over eight hours before sowing, and are weighed down with a couple of books on top of the fleece material I use to cover all my trays. It's going to be an interesting week. To read about my micogreen growing experiments from the beginning, start here. To see all posts about microgreens, click here. Don't forget to like, subscribe, follow, click, etc etc. Peace and love to all. Please consider disabling your adblockers when reading this site. I make every effort to ensure no inappropriate, rubbish or offensive advertising appears here, and nothing that is contrary to the spirit of this blog. So it's really nothing to be afraid of. Cheers. Grow Your Own Meals Indoors, Forever and Ever? Repairing my only pair of shoes again.